This Monday, Nick Lake will visit our Middle School book Club the Book Fanatics. Read an excerpt here. It is an awesome book. Very mysterious, sarcastic, human, and magical. Shelby (spoiler alert) is Deaf. She lives with her overprotective mother who won’t let her near men AT ALL. She won’t even be able to go to college. But she slowly gets to know why her mother is so scared of men. It is a cover. When she meets Mark, the cover, the lies start to explode. Check out a blog post he wrote about his inspiration for the book here. 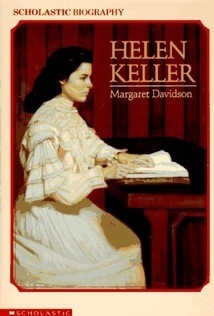 The Book Hellen Keller is a story about a deaf and blind child. What made her blind? She had a very bad sickness. Did she overcome her successes in life? Wow, what an amazing success Helen Keller is for a deaf blind. She learned braille, sign language and she even wrote books– that amazing! You should read this book because most likely it will broaden your interest in learning about deaf blind people.